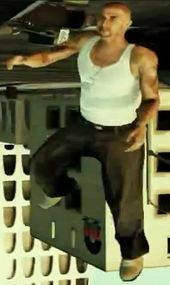 Esteban Jimenez is a character in the HD Universe appearing as a minor character in Grand Theft Auto V.
Esteban Jimenez, by 2013, had become a Los Santos Vagos gang member and lived in Vespucci Beach, Los Santos. Shortly prior to the of Grand Theft Auto V he had purchased a Bagger, which he later modified, from Premium Deluxe Motorsport owner Simeon Yetarian. Jimenez, however, defaulted on the first payment. Franklin Clinton and Lamar Davis then repossess his motorcycle, causing a shootout in the process. Esteban Jimenez can be killed during the Repossession mission although there is no requirement to kill him. This page was last modified on 22 April 2014, at 22:29.